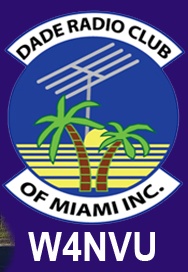 July 2014 – W4NVU – Dade Radio Club of Miami Inc.
Julio began with introductions and went through the room. Julio presented minutes. Brandon requested callsign of Lloyd Kurtzman be adjusted to reflect N4LJK and correction of Brianna’s callsign. Brandon moved to accept as modified, Migna seconded. Lloyd informed that we updated SunBiz to update correct officers so that we were in proper standing with the state. Brianna is selling raffle tickets for Baofeng radio at $5 each. Membership dues are due. Julio updated website with new pictures of Field Day and information on CERT training. Miguel reported as Club Elmer about testing session at Miami-Dade College – Kendall. 26 of 27 passed Tech and some attempted General, but none passed, as they had not studied General. Julio dug up newsletter and is looking for writers. Please contact him if you are interested. Jason and Miguel talked about Hambulance that cabling is almost done and we are still looking for radios and equipment and might need another work session. Steve reported about Field Day. We were a 9A station under 1×1 callsign W4B and it was a success. Julio showed pictures and there was plenty of food! Lloyd reported that The 2015 Tropical Hamboree is alive and well and will be held in The Coliseum in the Youth Fair. The price point was better than using Arnold Hall or the Miccosukee resort. The advantages of moving to Coliseum from Arnold Hall was price point, closer parking, and not walking “150 miles” to get to the show itself. Jason reported that the 147.000 is on his work bench and hopes to be alive on the bench this week. Further details will be revealed. Ray reported that the 146.76 is alive and kicking and is performing well RF-wise but is still low audio. Ray is hoping to get to the tower soon work on the audio. Lloyd asked about time-out on the nets, but he said it can’t be changed. Julio reported that the 224.200 is potentially being relocated to Flagler y 97 where Julio will have site access. More to come. Carl reported the 444.200 is alive, but people are abusing it. He threatened to turn it off during the “toma” nets. Noooooooo. Mr. D-Star no here. Emergency Coordinator – waiting for date on CERT and radio room equipment. RACES applications need to be forwarded through Miguel. Emergency Nets – Brandon reported about Wednesday Emergency Nets currently being on 76 until further notice due to construction of building where 925 is located. HF 10m is continuing on 28.350 USB and we are looking for more stations to contact HF. We are also looking for more net control stations. Contact Brandon for more information. ISS Contact – Steve talked about ISS Contact – no update at this time, but trying to set up a dry run of equipment at the school and setting exact date with NASA. More details to come. Miguel mentioned that Brandon should do a training about net control procedures during next month. Miguel talked about camping trip for DRC in October, potentially 24-25. Lloyd proposed calling it a “Hampout” (groan). Armando gave presentation on Red Cross. He wrapped up at 2052. Dave reported a new Extra, a new General, and 6 new techs. One former extra who lapsed was allowed to pass the tech and regain his Extra. Raffle was won by a ham who won the first time he came to a meeting in 97, so he offered to raffle again. Luis won the second raffle, and deferred the prize to Dave, who gave the prize to the youngest ham who became a tech. Jason moved to adjourn, Miguel seconded.